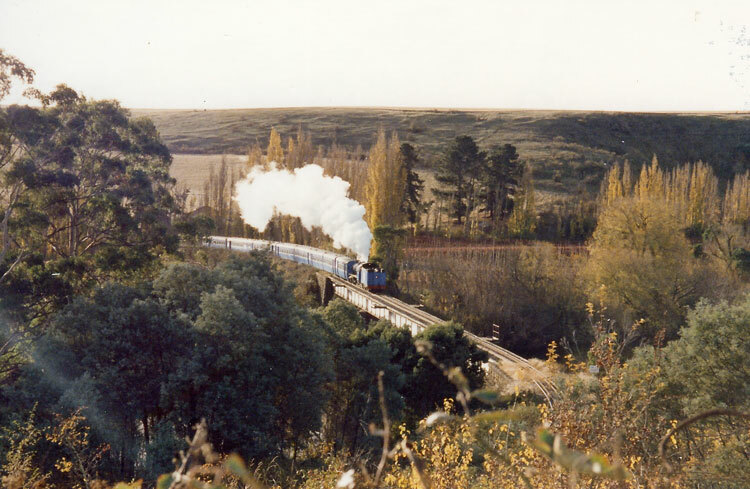 This photo is kindly provided by Stephen Zvillis and shows H2 on a Derwent Valley Railway service near New Norfolk on 5 May 1989. This 4-8-2 freight locomotive was built by Vulcan Foundry of Lancashire in 1951 as their builder's number 5950, being the second of 8 locomotives of this type which became the Tasmanian Government Railways' H-class. This design was a repeat of the "248 class" locomotives previously constructed by Vulcan Foundry for the Gold Coast Railway of western Africa. Both the Tasmanian Government Railways M & H-class locomotives were of modern design, featuring roller bearings on all axles and throughout the motion, and were the only Australian classes to be completely fitted-out with roller bearings. These locos also had SCOA-P wheels, like the Victorian Railways' R & J classes and the Queensland Railway's BB18-1/4 class. The H-class originally wore emerald green livery, but four members (H2, H3, H5 & H6) were later painted in the TGR's striking Post Office Red passenger livery. b Red-liveried H2 featured in the Tasmanian Government Railways centenary celebrations of 1971 and was officially retired in October 1975. The Tasmanian Government Railways were taken over by Australian National Railways in 1978, which appears to have prompted a cleanup of redundant railway assets. At this time H2, H3, H4, H5 and H8 were in storage at Launceston and quickly came up for acquisition. Whilst H2 and H5 were purchased for preservation, unfortunately sisters H3, H4 and much of H8 were scrapped in early 1979. 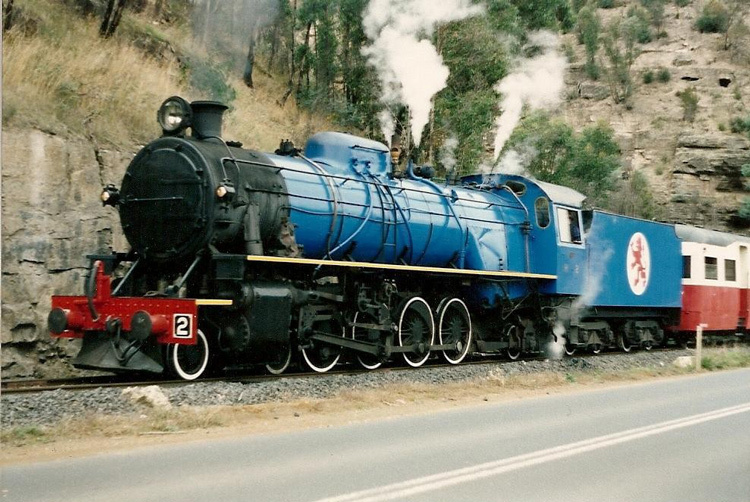 Upon preservation H2 was initially based at the Cadbury chocolate factory at Claremont, Hobart and used from the 1980's on Derwent Valley Railway tour trains along the scenic National Park branch. H2 wore Cadbury's purple livery for some time during this period, followed by an attractive blue livery. The Cadbury's branch became redundant during the 1990's and since been lifted, prompting the Derwent Valley Railway to relocate their operations to New Norfolk station on the National Park branch where workshops and storage facilities have been established in the station yard. H2 is currently under overhaul at New Norfolk, where it has more recently been joined by H5, M1 & MA1. Unfortunately the Derwent Valley Railway has been challenged in recent years by the closure of the National Park branch beyond Boyer, but hopefully this setback will soon be overcome so that H2 can resume tourist services though the beautiful Derwent Valley. 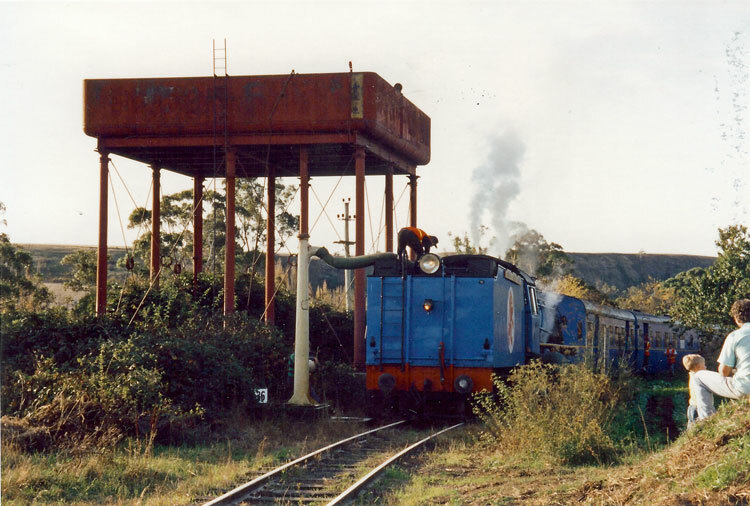 The webmaster spent an enjoyable day chasing H2 on a Derwent Valley Railway service in May 1993. The train ran tender-first on the return journey and is seen crossing a bridge in the afternoon light. H2 takes water on the return journey. May 1993.